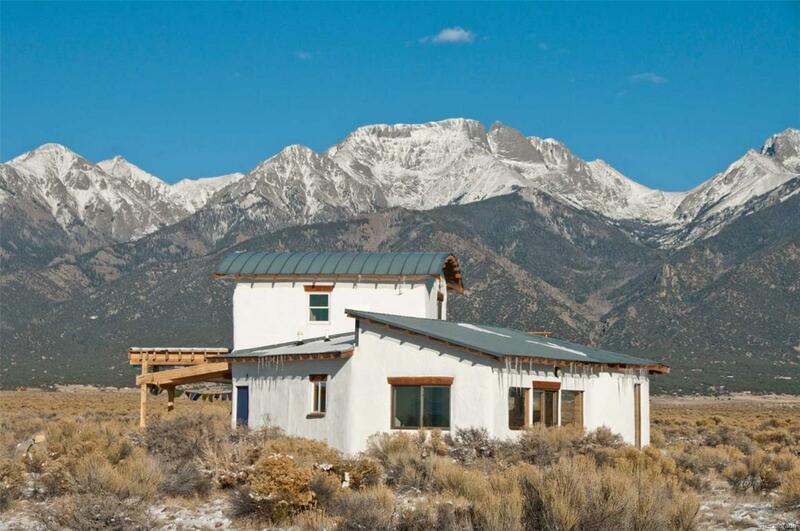 Exquisite off-grid home on 7.5 acres near southwestern edge of the Baca. Fabulous views of the Sangres & San Luis Valley, also close to protected lands of the Baca Wildlife Refuge & Sand Dunes Nat'l Park. Premium Douglas Fir frame build with strawbale infill uses passive solar design for maximum efficiency. Modern kitchen offers quartz countertops, tile backsplash, custom bamboo cabinets & large walk-in pantries, also a custom maple bar top & locally blessed Juniper tree for added natural charm. Main floor Bath is bright and spacious, with large soak tub, skylight, walk-in shower & custom tile. Main Bed has large windows & panoramic views. Second Bed up with stunning views, pvt deck & 3/4 Bath. Lots of extra attention-to-detail: curved trim, barn sliders, non-toxic finishes, etc. In-floor radiant heat is fueled by high-efficiency tankless propane heater. Cottage/studio has earthen plaster walls, wood stove & 12 deep-cycle batteries & inverter for 10-panel solar PV system. 1-of-a-kind!